Please, fill in the form above. 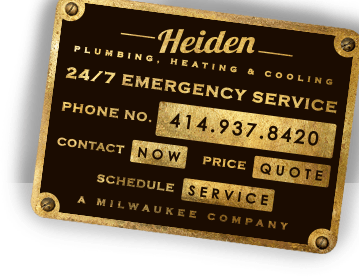 Heiden Plumbing, Heating, & Cooling has been in the business since 1925, repairing, replacing, installing, and designing quality work to keep your homes or businesses functional in any temperature. We’ve fitted many homes and business in the Milwaukee area with professionally done plumbing, heating, and air conditioning, and we can do the same for you. Stay comfortable throughout all 4 seasons, with services provided by Heiden Plumbing, Heating, and Cooling. We treat you right, because that’s how people deserve to be treated. Check out our experience with Fox 6’s plumbing sting. We’re the only company who didn’t cheat the customer.